Despite Super Eagles 4-0 victory over Libya on Saturday in Uyo, Nigeria's Technical Adviser, Gernot Rohr, has demanded more from the Ahmed Musa led squad as the team flies out of the Akwa Ibom State capital on a chartered flight for Sfax, Tunisia this morning. 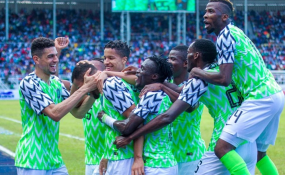 Nigeria is to engage Libya's Mediterranean Knights at Stade Taïeb Mhiri in Sfax, Tunisia in the reverse fixture of the AFCON 2019 Group E qualifier on Tuesday evening. Odion Ighalo hit his first hat-trick for the Super Eagles while Samuel Kalu added another late one to help them move up Nigeria to second spot in Group E - a point behind leaders South Africa. The Super Eagles who are aiming to return to the summit of African football after missing AFCON 2015 and 2017 back-to-back need at least a point in the clash with Libya in Sfax to keep their dream of qualifying for Cameroon 2019 alive. The Franco-German coach insisted that the 4-0 scoreline was commendable but several lapses noticed in the Match-day 3 clash in Uyo needed to be corrected in the reverse fixture tomorrow. "To win by 4-0 is good but this result does not mean we had a perfect game," Rohr told reporters immediately after the match at the weekend. "We had obvious problems defensively especially in the first half and before we play Libya again in three days, we must improve on our weak areas," observed the gaffer. He is not unmindful of the fact that the Libyans could ruffle Eagles feathers if some of the slips he noticed in the Uyo battle are repeated in Sfax. "Sometimes you get away with mistakes and another time you can easily be punished, it could make a difference whether you can qualify or not," he noted. Rohr however gave kudos to Eagles for exploiting the wing play for the maximum damage inflicted on the Mediterranean Knights. "Our expansive play - by exploring the wings - in the second half helped us against a good side. Now we must maintain discipline in all areas." Ighalo who plys his trade at Chinese side Changchun Yatai set the Super Eagles on their way with a penalty in the fourth minute. The 29-year-old struck again in the second half after 58 minutes and completed his hat-trick with 20 minutes remaining. Samuel Kalu made it 4-0 for the hosts with a 90th minute strike. Eagles began the AFCON 2019 campaign with a surprise 0-2 home loss to visiting South Africa in June last year in Uyo but won 3-0 away in Seychelles in last month. Only the top two teams in the group will qualify for next year's AFCON.